Chandelier by Stilnovo. Manufactured in Italy circa 1960s. Brass, enameled aluminum and brushed satin glass diffuser. Rewired for US junction boxes. Takes one E26 100w maximum bulb. Height displayed is for overall drop, not fixture. Overall drop can be customized. 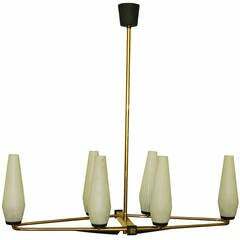 Stilnovo six lights chandelier, original glass shades. 60w/ bulb. 2 patinas brass. Polished brass / gun metal US wired and in working condition. 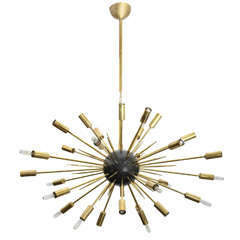 Spectacular example of midcentury imagination this 24-light Sputnik was made by Stilnovo with brass arms and an enameled black centre globe. 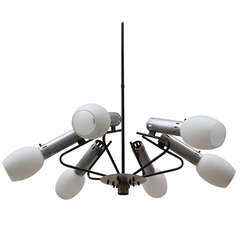 Large Stilnovo chandelier. Made in Italy in 1960s. Model 1173. Stilnovo label. 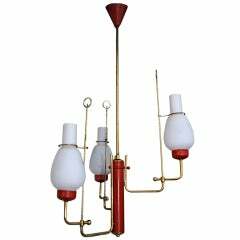 Italian chandelier with glass shades, aluminum neck and iron black painted base. 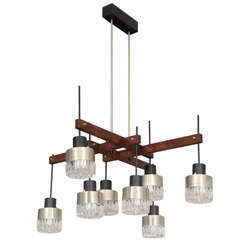 Eight-light chandelier of steel downlights with cut-crystal covers on a wood frame with two-rod canopy.